I just LOVE having my family all together again. Our trio is complete and its the best feeling in the world. 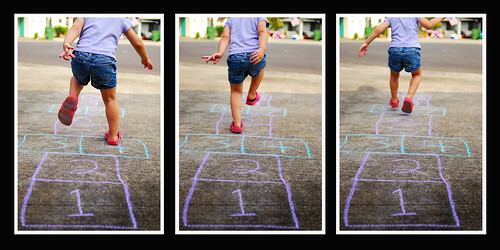 Today Daddy made Laylers a hopscotch in the driveway and she is in love with it. Even though she just kind of skips back and forth down it I still think its cute and took about four million pictures of her. Here is a nice little storyboard of the hopping. For the photos I used Pioneer Woman’s BOOST action. She’s awesome, folks. Seriously. Look for her under my Stalked list and check out her photos. She has a whole set of awesomely FREE actions as well. LOVE her!